If you have an existing menu, follow (a) else follow (b) to create a new menu. Go to to Appearance > Menus. In the “Manage Locations” area, under Main Navigation, select Main Menu. Click Save. Click on the + button or the create a new menu link. Enter a menu name and click Create Menu. Using the Custom Links and Pages boxes at the left, add items to the menu and drag/drop to arrange them. Note You can customize the top menu font styles (color, weight, size, etc) in Integral Options > General Settings > Typography under Top Menu Font. Important The theme demo content does not import the menu. You will need to configure the top menu manually. See instructions below. 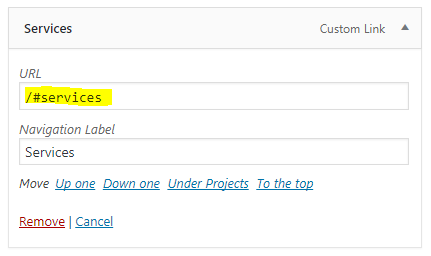 For menu items to work on the home page you will need to add Custom Links. These menu links will take you to the sections on the homepage. You will have to add each of them manually. Using the Custom Links boxes at the left, add items to the menu and drag/drop to arrange them (You will need to enter the URL and Link Text). The Custom Links URL meed to follow this format /#[section-id]. The section ID’s for all the homepage sections is listed below with a screenshot to help you along.